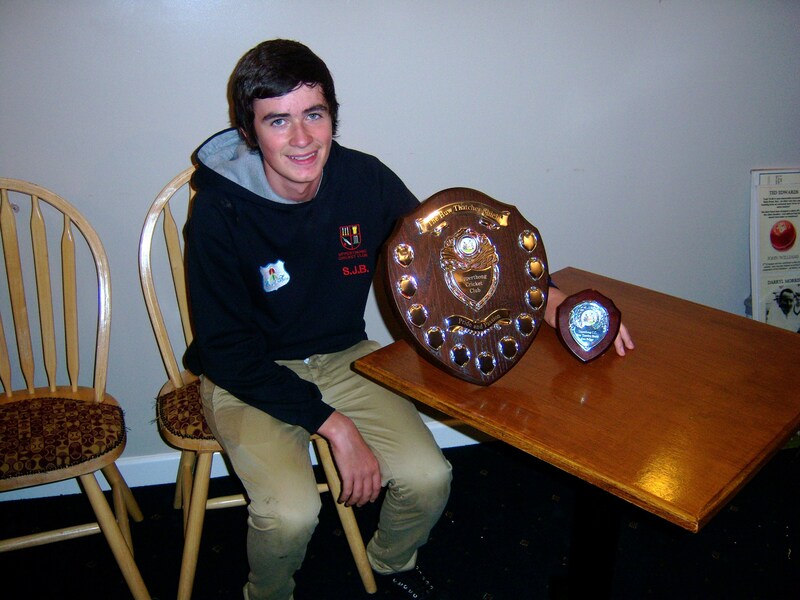 The Upperthong Cricket Club Huw Thatcher Pride and Passion Shield was presented for the first time on 25th September – the award was deservedly made to Sam Briggs. Maybe Huw was looking on as one of his oldest and best friends took this award with pride. The junior cricket awards event is always a good night; the oldest age groups had their presentations last and awards were given to all the under 15s and under 17s players along with special awards for batting, bowling and so on. Congratulations to all the players from these 2 age groups who were the age groups that Huw played with in the 2010 season and started nets with early in 2011. The team missed Huw’s powerful batting, and his fielding / catching this year, and even moreso missed him as a friend and team mate. It is to their credit that they had a tremendous season under Sam Briggs’ captaincy after the traumatic experiences in March 2011. After the normal individual awards, Rob Oakley introduced the ‘Huw’ shield – first recognising the tragic events of March 2011 and the impact it had on the team who pulled together to have a great season. Rob said some nice words about Huw and the his Trust, noting the fantastic support from the cricket club in raising around £5,000 to remember Huw and help brain injured people. Rob explained that there was a number of candidates for the award but that a worthy winner had been selected by a group of the club’s coaches. Rob explained that the award was being made for outstanding pride and passion in junior cricket – not necesarilly for the best cricketer but for all round contribution to the under 15s and 17s – and that the club had agreed the award with the Thatchers. In the event, the winner, Sam Briggs not only made a great contribution on and off the pitch, but also as a leading all rounder who had a great season with both bat and ball. Nick presented Sam with the award and said how much the award meant – particularly as many of the players had shared happy times with Huw at nursery, Upperthong Junior School, events such as Upperthong galas, the cricket club, High School, Hepworth football, and socially in general. While Nick had no say in the winner, he said it was a bonus that one of Huw’s oldest and best friends was presented with the award. Nick said that Upperthong (and in particular the cricket ground) is a special place with special memories – amd Sam was a big part of those. Nick noted Sam’s modesty when he performs well and his encouragement of his team mates event when (rarely) things hadn’t gone well for Sam personally in a match. These are rare qualities for a 13, 14 or 15 year old captain. Nick illustrated this by remembering an occassion in 2010 at Upperthong when Huw had played an excellent innings and Sam (eventhough on that day hadn’t got a particularly high score) led the congratulations as Huw left the field to applause from his team mates. Huw learned a lot from cricket in terms of concentration and personal discipline and learned some of these things from team mates such as Sam. These qualities make Sam a deserved winner. Nick went on to thank Huw’s team mates and coaches for their contributions to Huw’s development over the years and to thank everyone for their support of Huw’s Trust – in particular the Oakleys. As well as the funds raised by the Cricket Club for Huw’s trust, this annual award is a special way to remember Huw who is missed so much as a friend and team mate. Huw was a lovely young guy – full of life and fun – and had emerged as a powerful and clean hitting batsman. He is adored by many people in Upperthong, including at the cricket club. Here are some pictures of Sam receiving the award on 25th September 2011 along with a picture of Huw receiving his annual award from Yorkshire captain Andrew Gale in 2009.